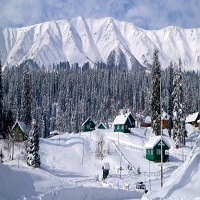 Dubbed as skiersâ�� paradise, Gulmarg is indeed amongst the best places to visit in Jammu & Kashmir. Located approximately 52kms away from capital city Srinagar, Meadow of Flowers as it is popularly called Gulmarg is a haven for adventure enthusiasts. Along with prominent skiing options, trekking, snowboarding, golfing, mount biking and fishing are the prime options that Gulmarg overwhelms you with. Visit Kongdori, Shark Fin and Apparwath Peak not only for skiing but also to witness the splendid natural landscape of Gulmarg. Other places to see the blessings of majestic nature near Gulmarg are Nagin Valley (for which you have trek), Khilanmarg, Frozen Lake and Bota Pathri. Baba Reshi and Gulmarg Gondola (Cable car) also makes for a must visit in Gulmarg.